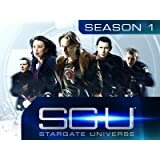 Stargate Universe premiered on Syfy on October 2, 2009. A band of soldiers, scientists and civilians are forced through a stargate when their hidden base comes under attack. The desperate survivors emerge aboard an ancient ship, The Destiny, which is locked on an unknown course and unable to return to Earth. Faced with meeting the most basic needs of food, water and air, the group must unlock the secrets of the ship's stargate to survive. The danger, adventure and hope they find on board Destiny will reveal the heroes and villains among them.